Visit us for the 2019 Toyota 4Runner in Hamburg, PA! You'll love that this vehicle gives drivers more than ever before. 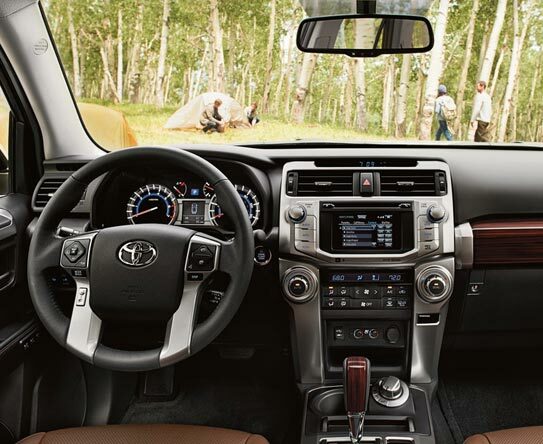 Inside the comfortable cabin of a 4Runner, you can hit the road without looking back. The all-new 4Runner features black roof rails and durable panel guards. What are the Key Features of the 2019 Toyota 4Runner? The 18" and 5-spoke black alloy wheels make it easy for drivers to enjoy their drive! The new 4Runner is also more versatile than ever with its JBL® Audio, the Entune™ App Suite with Integrated Navigation that keeps you updated and entertained. The available heated front seats are also a nice touch. Toyota delivers with this compact crossover. Schedule a test drive in Hamburg, PA now and you'll see just how capable the new 4Runner is! What Else Does the 2019 Toyota 4Runners Offer? At Freedom Toyota of Hamburg, we know that your SUV needs to move with you, and the 2019 4Runner is set to do precisely that. The SUV features available heated front seats, which ensure that your passengers remain comfortable on even the coldest of mornings. The SUV also features 60/40 Split Rear Seats, which come in handy during moving and camping trips with the family. The 2019 4Runner’s active safety features also play a roll in its desirability. The 4Runner offers drivers features like the Lane Departure Alert, which is part of the Toyota Safety Sense suite that protects motorists on the road. Other features outside of the safety suite also have their protective properties, such as the LED headlights with LED Daytime Running Lights. What are the Prime Safety Features of the 2019 4Runner? Toyota prides itself in being a leader in vehicle safety, and the 2019 Toyota 4Runner is a prime example of this fact. The 4Runner features eight standard airbags, side impact door beams that absorb energy during collisions, and a tire pressure monitoring system. The Star Safety System also offers an array of options, such as Traction Control, an Anti-lock Brake System, Brake Assist, and an Electronic Brake-force Distribution system with Smart Stop Technology. What Trim Levels are available for the 2019 Toyota 4Runner? The new 2019 Toyota 4Runner comes with personalized trims that will make your head spin. Whether you're looking at the base 2019 4Runner SR5 (4X2) trim or the TRD Pro, you'll find something spectacular within the confines of the 4Runner's trim levels. While you're scouting different trim options, please be mindful of the fact that these vehicles all feature ToyotaCare, a free maintenance plan that lasts either up to 200,000 miles or 2 years––whichever comes first! This plan will grant you access to maintenance and 24-hour Roadside Assistance. Contact our professional team about the additional benefits that come with owning a snazzy new 2019 4Runner SUV in Hamburg, PA.
2019 4Runner SR5 (4X2) – The 2019 4Runner SR5 (4X2) features 270 hp @ 5600 rpm and we're just getting started with power. The 4Runner also features 278 lb.-ft. @ 4400 rpm thanks to its powerful engine. The touch-screen display comes with Bluetooth® hands-free phone and voice-command controls. The 4Runner also comes clad with state-of-the-art features such as an LCD screen with odometer, trip meters, and average fuel economy; ECO Driving Indicator and warning messages, and an In-key remote keyless entry system. 2019 4Runner SR5 Premium (4X2) – The 2019 4Runner SR5 Premium (4X2) has a 4.0L V6 engine, and boasts 5-speed Electronically Controlled automatic Transmission with intelligence (ECT-i) and a sequential shift mode. Then there's the high-resolution Multi-Information Display (MID) with outside temperature info, and the Bluetooth® hands-free phone and voice-command controls, Backup camera with projected path, and more. It also has a locking rear differential and Crawl Control (CRAWL) switches with a HomeLink® universal transceiver. 2019 4Runner TRD Off-Road (4x4) – The starting MSRP of the 2018 4Runner Limited is $40,685, and it comes standard with several more premium features, such as a deck rail system with four adjustable tie-down cleats, the large 38-gallon fuel tank, automatic dual zone climate control, Entune™ Premium Audio with Integrated Navigation and App Suite and Siri Eyes Free, HD Radio™ with Predictive Traffic and Doppler Weather overlay, and SiriusXM Radio. Inside, there is leather-trimmed and heated front bucket seats, a power sliding horizontal rear window, and optional moonroof. 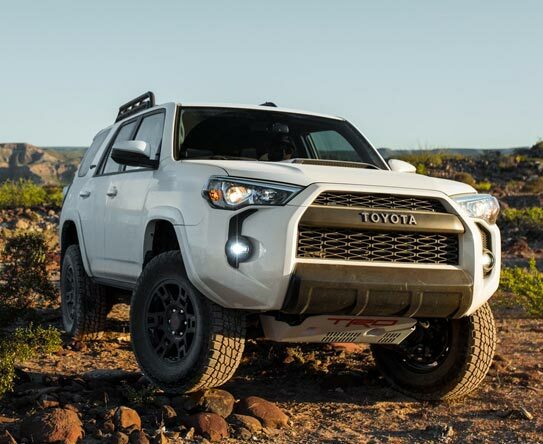 2019 4Runner TRD Off-Road Premium – The 2019 4Runner TRD Off-Road Premium comes standard with Color-keyed front and rear bumpers with silver accents, Heated power outside mirrors with turn signal indicators, Roof rails, "TRD Off-Road" external hard badges, and 17-in. 7-spoke alloy wheels. The interior received quite the upgrade as well, as it now features a cargo area 120V 100W/400W AC power outlet, an Auto-dimming rearview mirror, Dual sun visors with illuminated vanity mirrors and extenders, and much more. Drivers who want access to hearty features such as SofTex®-trimmed 40/20/40 split reclining, and fold-flat second-row seats and a Leather-trimmed steering wheel with controls will love this SUV. 2019 4Runner Limited (4x2) – The new 2019 Limited (4x2) trim features Dual zone automatic climate control with air filter and second-row vents, a Multi-Information Display (MID) with outside temperature, and an average fuel economy and distance to empty. Then there's the stylish interior with its perforated leather-trimmed heated and ventilated front seats, which make even the longest rides more comfortable than ever. 2019 TRD Pro – The new 2019 TRD Pro features an exterior that will turn heads. This trim level features a power rear liftgate window with auto up/down, and jam protection, rear liftgate window defogger with timer and UV protection, and power door locks with programmable auto door lock logic. The vehicle also has an amazing selection of safety features, including the backup camera with projected path, Overhead console with Multi-terrain Select, Active Traction Control (A-TRAC), VSC cutoff, locking rear differential and Crawl Control (CRAWL) switches, and lastly the HomeLink® universal transceiver. Limited Nightshade Edition – This is a model with color-keyed rear spoiler with LED center high-mount stop light and integrated concealed rear wiper with mist cycle and skid plates located on the engine/front suspension. There's also a fuel tank and transfer case, which further adds to the mystic of the new Nightshade Edition. If you're looking to explore the world is a luxurious 4Runner, choose this model for its chrome door handles with touch-sensor lock/unlock feature and roof rails. Are you ready to shop for the new 2019 Toyota 4Runner? As your go-to Toyota dealer in Hamburg, PA, we urge you to test drive the new 4Runner today. Slide into the comfy cabin and see why it is the best! If you are ready to buy a new Toyota vehicle in Hamburg, PA, visit us. We'll set you up with our professional finance department and even help you appraise your trade-in vehicle. When the time comes for your routine service, check out our new compact crossover. Get in touch with us today and schedule automotive service with a vehicle that has access to ToyotaCare, a no-cost maintenance plan. There's so much to love about the new and improved 4Runner, get down here and see what we're talking about!